What does this 100-year story tell us about Ukambani and regional environmental change? Is Ukambani a critical zone? What lessons does it hold for understanding the regional dynamics of environmental change? Clearly, if "critical" implies that environmental degradation has so eroded life-support systems as to preclude the continuation of current land-use systems and lifeways, then critical it is not. Along the continuum from criticality to sustainability (see chap. 1) the region falls best into the category "endangered" - that is, Ukambani is susceptible to a critical situation within the next generation. In this case, the trajectories of land degradation, environmental quality, wealth, and population (figs. 5.5 and 5.6) are particularly ambiguous and unpredictable, with a wide range of possible outcomes, both in the aggregate and for distinct groups and subregions (fig. 5.7). In figure 5.5, regional environmental quality is expressed in qualitative terms as (1) the condition and quantity of resources available for people, and (2) the numbers and diversity of wildlife. The graph depicts a sharp downturn in both wildlife and other natural resources (forest, soil, water) during the drought and plagues of the 1890s, a partial recovery at the turn of the century, followed by serious deterioration in forests, soils, and water resources from 1910 to 1920, owing to the sedentarization and concentration of growing (recovering) populations in ecological zones 4 and 5. Although wildlife stabilized to some extent after the establishment of parks and ranches in large tracts (albeit limited in extent and subject to legal hunting and poaching), the processes of deforestation and soil erosion continued at an accelerated rate within the limited confines of the "African reserve" farming areas. A moderate recovery began in the 1930s and continued into the 1950s, with a combination of local agricultural innovation and soil-conservation and rehabilitation measures promoted by the state. The land-tenure reforms and settlement programmes that began in the mid-1950s brought a new wave of agricultural expansion into marginal lands, including deforestation of many areas of wildlife habitat (Yatta Plateau and dry plains). 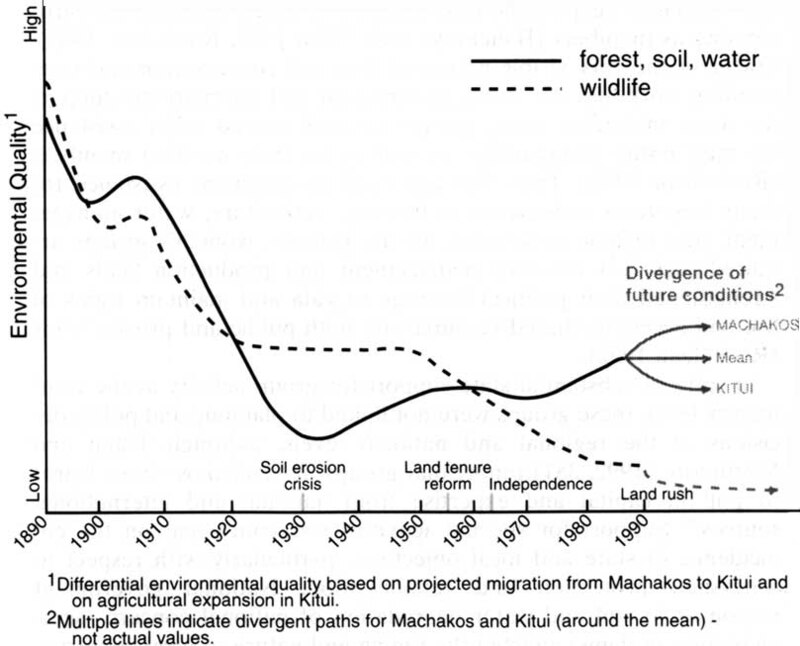 During the last two decades, the wildlife has continued to decline, more slowly, while environmental recovery due to agricultural intensification, soil conservation, and reforestation in some parts of the Machakos has contributed to further recovery of ecosystems in the upland and moister parts of the region (Tiffen and Mortimore 1992). The current land rush and settlement in Kitui may well bring a sharp divergence in the futures of Machakos and Kitui districts and in the wetter upland versus dry lowland sites within the region. 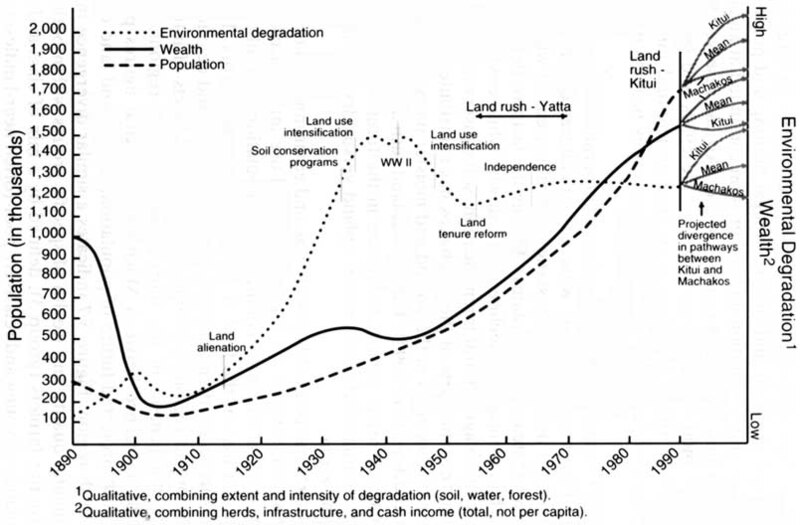 The trajectories of wealth, population, and environmental degradation illustrated in figure 5.6 suggest that land-use intensification and soil-conservation measures counteracted population and other production pressures on the land at particular points in history. During the land-rush and settlement periods, however, the land degradation in newly opened regions outstripped the counter-effects of intensive resource management in the more densely settled regions. Once again, the divergence between Machakos and Kitui figures prominently in the projected future of population, wealth, and land degradation in the region. Figure 5.7 indicates a similar divergence in the environmental quality and wealth of specific groups within both districts. Frontier farmers (group 3), defined by a mix of class and age, consist mainly of young and relatively poor (often near-landless) people who still have enough capital or labour to sell or trade for land in drier areas, in combination with some entrepreneurs from more densely settled areas. The near-landless and landless people (group 2) who remain in the established farming areas are primarily the poorest households of the prior and rising generations as well as many single (or widowed, abandoned, or divorced) women. The apparent stability of Machakos over the last decade (Mortimore 1991, 1992; Tiffen and Mortimore 1992; Tiffen 1991a,c) may be attributed in part to the displacement of many of the poorest (or the next-poorest group, the near-landless-but-still-mobile) people to the rangelands and sparsely populated dry farmlands of frontier areas in Machakos and Kitui. This repeats, at a larger scale, the process of displacement that occurred between the wetter hills and the lowland grazing areas within Machakos during the 1920s and 1930s, and the settlement of portions of Yatta Plateau during the 1950s and 1960s. If the past is any indicator, then it is reasonable to expect a cycle of serious environmental degradation in Kitui and the remaining frontier zones of Machakos during the next two decades. The distribution of income streams between ecozones (Tiffen 1991a,c) and the higher reliance of zone 5 households on migration and remittances during the drought of 1984-1985 both suggest that future residents of Kitui will be increasingly dependent on wage labour, yet they will be even further removed from local and national centres of employment, within an increasingly competitive labour market. Already young Akamba men are working in construction and related trades as far afield as Garissa, a garrison town in northern Kenya (field interviews, 1991; Bashir Jama, personal communication 1992). For all of these reasons the region is best described as being on a slippery slope that could lead to either higher or lower wealth, reduced or improved well-being, and slower or more rapid environmental degradation, most likely split by subregion and by land-user groups. The net effect at the regional level over the next two decades is likely to be higher aggregate regional wealth, stable or declining per capita wealth, increasingly skewed distribution of land and access to resources, and net environmental degradation. The last would consist of further disruption of watershed systems, with attendant effects on the water supply caused by further deforestation and overgrazing in frontier areas. The hydrologic system in this semi-arid environment is both the linchpin and the "Achilles heel" of the regional ecosystem. Water is a scarce resource, crucial to life support and livelihoods, and yet it is the single most sensitive element within the system in its responses to land-use change, reductions in forest cover, and increasing compaction near-sedentary cattle. This translates into a major criterion for judging land-use options in degraded areas. For example, intensification of agriculture in a deforested, degraded area could well restore partial tree cover through on-farm and boundary planting of trees. Although it is quite possible that this could substitute for forest products (such as fodder and wood fuel), the replacement water-storage and distribution functions of the forest would require elaborate physical structures and management systems. An effective response to offset deforestation and watershed disruption would require major labour, management, and capital inputs from the farmers of Ukambani. This is a high expectation given the increasing proportion of smallholders and near-landless people who will either clear new plots from forest and range elsewhere, colonize marginal and fragile spaces within their local landscapes, or deplete the remaining resources in their existing plots in order to compensate for the shrinking size of holdings as plots are subdivided to children. Eventual outcomes depend on a host of contingencies in the national and international systems in which the region is embedded, as well as on the vagaries of local and regional weather and internal social and political processes. Mortimore (1992) points out the folly of the dire predictions of imminent desertification of the 1930s. After six decades and a five-fold increase in population, not only is Ukambani not a desert, but soil condition and tree cover are improved in much of Machakos District. Likewise, Downing (1991, 379) concludes that "visions of eco-catastrophe in the 21st century are not warranted!" Yet fear of eco-tragedy is not unrealistic for the "bottom" 20-30 per cent in Ukambani who are food short and food poor, and who are likely to experience food deprivation in future droughts and displacement over the long term. The region may sustain livelihoods and life support for some, as well as contribute to national production, at the expense of excluding an ever-larger number of Akamba from access to home, workplace, and habitat within its borders, and by relegating many of those who remain to a precarious and vulnerable status with respect to ecological and economic perturbations. That 30 per cent of the children in Kitui were stunted from malnutrition in a "normal" year (Anyango et al. 1989; CBS 1983) suggests that a large segment of the population in the drier parts of Ukambani is highly vulnerable to future fluctuations in local weather as well as in local and national markets for staple foods. Biological impoverishment of the otherwise "stable", "recovered" landscape in the higher-potential lands (mostly in Machakos) may also narrow future livelihood and life-support options for all those who remain in Ukambani. If the region is not critical in the absolute sense, is it, on one of its potential trajectories (figs. 5.5 and 5.6), sustainable? Sustainable development postulates the reconciliation of "environment" with "development." Development worth sustaining will need to incorporate and reconcile a multiplicity of views on environment and development as experienced by those who would be "sustained." 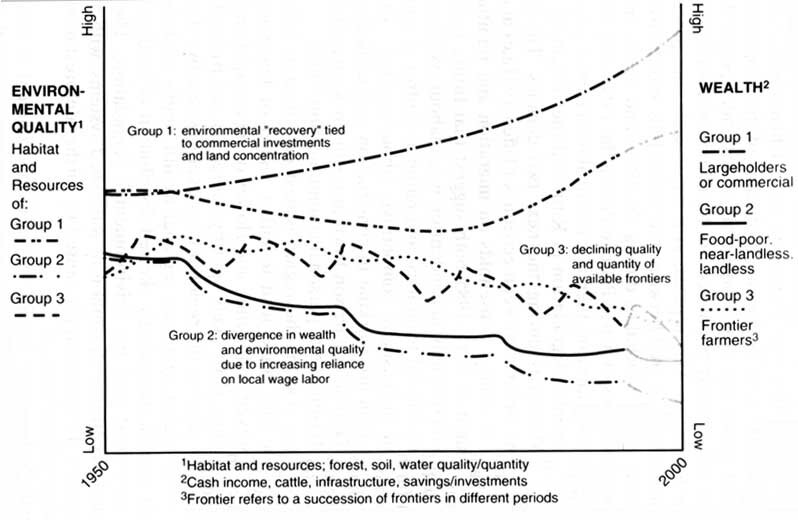 The 100-year history of ecological and economic crises in Ukambani suggests several themes that focus the concerns and experiences of a multiplicity of groups among the Akamba, including the poor and the displaced whose fortunes and futures are not apparent in the greening landscape and the financial ledgers of the region (fig. 5.7). The question of regional sustainability is transformed when the focus is on the people of the region, on those who call it home. Population then becomes a question of difference and distribution, rather than sheer numbers. The question of poverty broadens, as noted in chapter 1, to include the changing well-being, quality of life, and range of options for the poor in Ukambani, including their livelihoods and use of natural resources. Land degradation expands from physical degradation of the "resource base" for national production to encompass the life-support and livelihood needs of the rural poor and the paradox of land-use intensification as a solution to poverty and land degradation (fig. 5.8). The degradation of water resources extends beyond national hydropower supply to encompass the amount, timing, and quality of local water sources for domestic, agricultural, and livestock uses. In the history of Ukambani, all of these issues intersect in the continuing and deepening problems of drought, water shortage, poverty, and hunger with the changing nature of land cover, property regimes, mobility of people, and the level and terms of integration of economic and ecological systems from local to international scale. Two major indicators of the "stability and health" of the region and the trajectory for the future are the status of water resources and the vulnerability of the region as a whole to drought. The savannas and the ranges of wooded hills that cover much of East Africa, and Ukambani in particular, are susceptible to natural hazards, which can become disasters as population densities, production pressures, or both, increase, and as traditional drought response and famine prevention measures are pre-empted by changes in land cover, land use, livelihood, and land tenure. All of these proximate causes are driven by a combination of national and international development and environmental policy, commercialization of rural production, and, increasingly, rapid population growth. Whereas mass wasting of hillslopesis a major issue in the Nepal middle mountains (chap. 4) and groundwater depletion and soil erosion affect the agricultural communities of the US Southern High Plains (chap. 6), the savannas and dry forests of Ukambani are periodically subjected to drought. These events may result in famine under conditions of extremely severe and prolonged drought or under fairly routine drought conditions exacerbated by increasing pressures to produce. As Blaikie and Brookfield (1987) point out, production pressure is driven by the interactions of population, market, and public intervention brought to bear on the region at a given point in history, based on prior conditions resulting from a long history of such interactions. The Akamba have for centuries sought a guaranteed, secure subsistence in an environment that has periodically brought the threat of famine. Drought preparedness in the nineteenth century consisted of a mix of adaptation in place and expansion into new places, both predicated on the need to utilize every resource and to frame appropriate strategies for survival. Traditional lore concedes, however, that all this is nothing before the "famines that kill" (the worst-in-a-hundred-years) but could soften the blows of lesser, more frequent famines. During the past century, and particularly since the disruption of regional patterns of mobility by people and livestock and the shift from sorghum to maize as the staple crop, drought has often produced famine, especially in the drier areas of Ukambani. On a more regular basis, the degradation of soil, water, forest, and range resources has reduced the supply and the quality of these resources to fulfil basic needs. Environmental degradation has also diminished the productive capacity of many local land-use systems, both for subsistence and for commercial purposes. New state and commercial institutions brought with them a new logic of production, exchange, and mobility, as well as substitutes for locally produced goods and services. People also note major problems with these alternative sources of income and food. Employment of men in the army, police, and urban areas and out-migration of single women to work as resident labourers in the plantation workforce have all become less viable options during the last decade. Recent moves to diversify the ethnic composition of the army and police force have left less "space" for Akamba men. Saturation of the urban job market has also resulted in many men returning unemployed from job-seeking forays and short-term stints in the capital city. Women in the plantation workforce regard it as a last resort from which they often cannot return to their home villages. The rising generation of young people in Ukambani confronts a resource base that has been largely circumscribed by encroachment of commercial interests into the best agricultural lands and the removal of valuable trees (timber, fuelwood, and fodder resources) from the less productive "marginal" lands. Their parents have settled or used the remaining area, with limited scope for subdivision in the most densely settled agricultural communities. The youth are caught between two forces: population pressure, land concentration, and declining resources from within juxtaposed with a declining capability of urban centres to absorb migrants and a growing return flow of migrants. Added to this is the constant pressure from government and commercial interests to provide raw materials to the city and export cash crops to earn foreign exchange. The result is likely radically to alter life as the Akamba people have known it. Alternatively, land-use systems may change slowly and incrementally, stabilizing through land-use intensification and conservation measures as described in several recent studies (Mortimore 1992; Porter in prep. ; Tiffen 1992a,b). The latter trend, however, will most likely exclude increasing numbers of people from that experience, by relegating "surplus" people to permanent residence elsewhere, and rendering them homeless (in the sense that home has been understood in their culture). Alternatively, the migrants from Machakos District may continue to stream into the dry forests and rangelands of neighbouring Kitui District, thus achieving apparent sustainability in one part of Ukambani (Machakos), at the expense of the land and the people (including the new migrants) in the drier half of the region (Kitui). In terms of the physical resource base, it is the disruption of hydrological cycles that will do the most damage to both biological and economic productivity. The story of land-use change in Ukambani is a story of people maximizing returns to water (Tiffen 1991a) under changing economic and ecological conditions, at different scales, and with varying degrees of control over their own and other people's use of the resource. Whereas people formerly concentrated around permanent groundwater sources or along perennial streams, widespread deforestation and soil compaction have led to the transformation of many permanent groundwater sources to seasonal supplies and have reduced perennial streams to intermittent flow. This has changed water quantity and quality and has radically altered the timing and terms of water availability for agriculture, livestock, and domestic use. Moreover, the changes in use pattern engendered by these effects has in turn caused further damage and disruption in watershed systems (fig. 5.9). Soil erosion is the single most visible and notorious form of environmental degradation in Ukambani (Dunne, Dietrich, and Brunengo 1978; Moore 1979a,b). Ironically, it is also probably the most reversible - that is, the most responsive to restoration and rehabilitation. Past experiments in range management and land rehabilitation (e.g. research and project reports from Baringo, from Machakos and Kitui districts, 1930s to present) suggest that many of the degraded sites, if fenced and protected, are likely to recover rather quickly and dramatically. Until such measures are taken, however, many areas will produce less fodder, food, and other goods and services essential to rural life. Although none of the damage is irreversible at the local scale with major investments of labour, management, and capital, no structure or process is currently in place that is poised to effect such a reversal at the regional level. Overall, the regional disruption of hydrologic systems caused by the interaction of state policy, national markets, and individual farm households is now left to a process of intensification and recovery on a farm-by-farm basis. This is true for land cover and condition as well as for intensification of water use and management, with major water-supply infrastructure being developed at community level in scattered locales throughout the region. Not all households and communities are in the same position to invest in or to take advantage of new water-supply and drainage infrastructure. Consequently, the process of watershed degradation is likely to persist, concurrent with water resource development and watershed rehabilitation at dispersed sites throughout Ukambani (as in the case of deforestation and reforestation). In both cases a sustainable future rests on a dramatic and widespread intensification of the current land-use system, under changing and somewhat unpredictable policy and market developments and a growing population. Equally important in the long run is the biological impoverishment that attends loss of genetic and species diversity. This includes the loss of genetic resources in the form of locally adapted varieties, as well as the loss of entire species from the region, along with the knowledge of their ecology and economic use. Local varieties of crop plants, as well as wild relatives of local cultivars, have been lost, although the species may persist in other regions. Many species of wild foods and medicinal plants, fodder sources, fibres, and building materials have been lost to regional access and use. The result will most likely combine a change in local economy, diet, and health with an erosion of "genetic diversity" in the biological sense. The severity and the consequences of all of these various types of environmental "damage" will vary according to the intended uses and the land users concerned. Table 5.7 summarizes the three types of damage likely to be imposed on future Ukambani generations. The actual expression and the consequences of these forms of environmental change are most likely to diverge sharply among agroecological zones, by district (which reflects a combination of agroecological zones, ethnic subgroups, and history of separate policies and market linkages), and by gender and class within places. 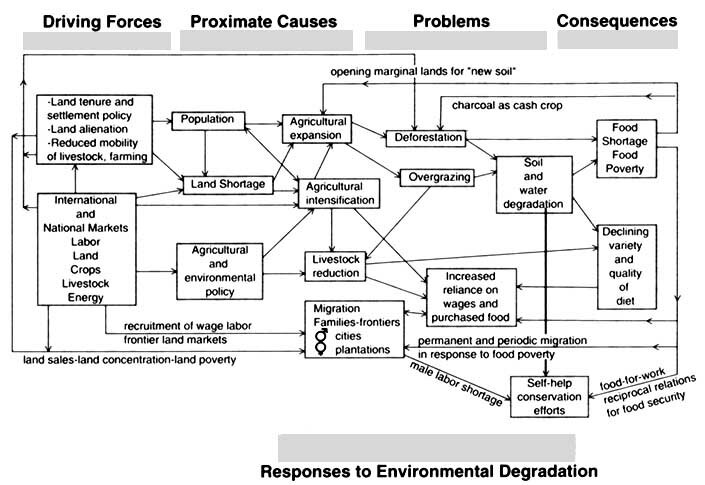 The variability of the landscape, livelihoods, and life situations of the people in the region will filter the driving forces of state economic, environmental, and land-tenure policy, through a multifaceted prism of specific ecological structure and function, different types of environmental degradation, and the socially mediated experience of those changes (fig. 5.8). The latter includes differential vulnerability to stress, degree and nature of awareness, and type and effectiveness of response. What is really at issue for the people of Ukambani is the ability of the existing mixed land-use system, with its current biotic composition, to maintain or regenerate itself and to support the current and rising human population. The current divergence of environmental, economic, and social indicators between Machakos and Kitui, and between distinct groups (by gender, class, and generation), is illustrated in figures 5.5, 5.6, and 5.7. The future trajectory of the region will ultimately depend on whose home, habitat, and workplace it will and on the ability of affected groups to moderate state and market influences to serve their own interests, to reconcile population and production growth, and to negotiate a new basis for integrating ecology and economy in Ukambani as a region. 1. Since 1991, these two districts have been subdivided into four separate districts; all records contained in this chapter refer to district boundaries that defined Machakos and Kitui, and Ukambani up until that time.